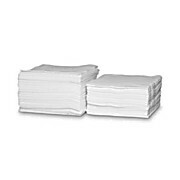 Made of Double Re-Creped (DRC) toweling they are improved and better in virtually every way, including: Softer, thicker, and more supple. Faster absorbency, higher capacity. Stronger, more durable when wet. Closer to cloth-like softness and performances.